Infused with the signature ingredient of Argan Oil as well as natural antioxidants, the lightweight serum softens and nourishes hair, combating frizz and enabling a smooth, effortless blow dry. Non-greasy and suitable for thick, course and curly hair types, the treatment leaves hair looking immaculately polished with a mirror-like shine. For coarse hair, apply ½ pump into palms. For textured hair, apply 1 to 1 ½ pumps. Distribute with fingertips on damp hair from mid-length to ends. 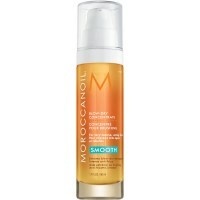 Apply on dry hair for added shine and frizz reduction as a finisher.